Jan 23, 2019 Posted by AAfterwit on Jan 23, 2019 | Comments Off on When Is A Picture Not A Window? When Is A Picture Not A Window? Millie Francis is an 85 year old woman who is devoutly Roman Catholic. Francis lives in the Bradenton Tropical Palms trailer park in Bradenton, Florida. Francis had a problem. According to her, Francis was dealing with a nosy neighbor who was continually peeking into her front window as well as flashlights from security guards shining in the window at night. Francis sought and gained the permission of the trailer park management to change out the window in order for her to not be bothered by the neighbor and guards. One those facts both Francis and the management of the trailer park agree. 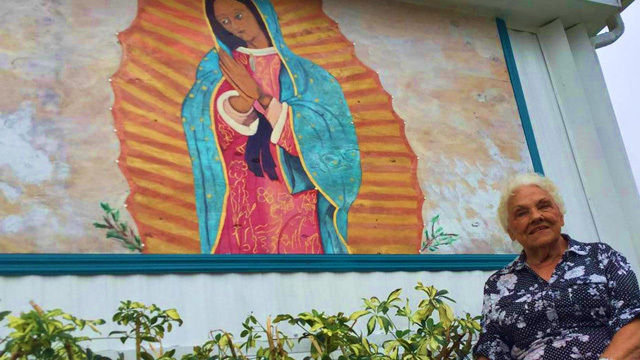 After receiving what she calls “enlightenment” prior to mass, Francis commissioned artist Ingrid Brandt to paint the image of Our Lady of Guadalupe – one of Mary’s many Catholic titles and the patroness of Mexico – on a piece of plywood. Francis put the plywood up in place of the aforementioned window. The management of the trailer park balked and balked big time. [Property manager for Vanguard Property Management out of Tampa, Janet] Nowakowski first said Francis didn’t get permission through the park’s architectural review committee, but she did get permission to remove the window. Nowakowski then said Francis was approved but was given until Oct. 31 to complete the window replacement. Nowakowski said the project wasn’t completed on time and therefore, according to park rules, Francis must resubmit her project to the committee for approval or remove the painting. Francis said the window replacement was done on time, but the painting was only recently completed. So for her, it’s not about the window removal, it’s about her decision to paint the Virgin Mary and believes she’s being discriminated against. Francis said management told her they will come and remove the painting if she does not, and has given her a matter of days to get it done. That didn’t go over well with the feisty 85-year-old. Francis is claiming that the management company wants the painting to come down because of religious reasons. The management company has filed papers to take Francis to arbitration in order to have the painting replaced with a window. We wonder what the management company thought was going to replace the window when Francis got permission. It makes no sense to us that the solution to stop flashlights shining through the window and neighbors looking in the window to replace the window with another window. It would be much cheaper and better if a window was the only solution to just heavily tint the window itself and not replace it. It seems clear to us that Francis was trying to block – not reduce – prying eyes and lights which means an opaque replacement for the window. We therefore find the demands of the property management to replace one window with another to not be within the spirit of what they themselves approved. At the same time, we find Francis’ stance a little odd as well. If one moves into a community and you sign and agreement that says something like, “outdoor decorations and paintings must be approved,” don’t get upset when you are held to that. It is a strange case and one where we suspect that both sides are neither right nor wrong, but have become so entrenched in their positions that they are not willing to compromise or budge. There is no maxim, in my opinion, which is more liable to be misapplied, and which, therefore, more needs elucidation, than the current one, that the interest of the majority is the political standard of right and wrong. Thomas L Gaume on Fifth Circuit Weighs In On Government Facebook Pages And Speech. Renee Felty on Randy Fine: Offered Without Commentary. Thomas L Gaume on Dear Randy, Enough Is Enough. Percy Veer on Take It To The Bank. Percy on Palm Bay: Palm Bay V. Lori Scott – The Scott Response. Fifth Circuit Weighs In On Government Facebook Pages And Speech. Guys Invades Girls’ Bathroom. Girl Knees Guy. Girl Expelled. Randy Fine: Offered Without Commentary.